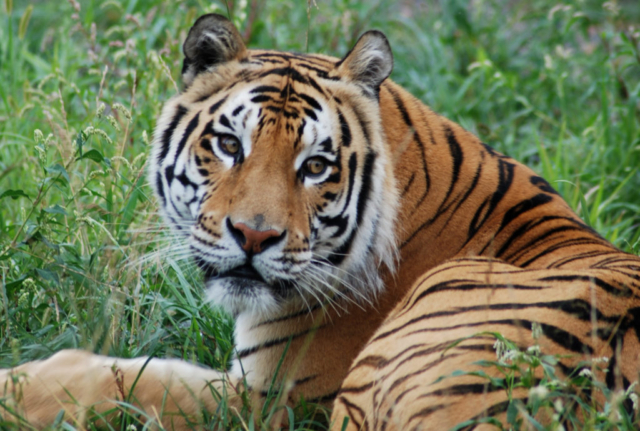 The Wildcat Sanctuary (TWS) is a 501c3 non-profit, no-kill rescue facility located in Sandstone, MN. TWS provides a natural sanctuary to wild cats in need and inspires change to end the captive wildlife crisis. TWS is funded solely on private donations. The Sanctuary is a rescue organization and not open to the public. Combining natural and spacious habitats with a life free from exhibition, TWS allows all residents to live wild at heart. TWS is committed to public education about the captive wildlife crisis in order to create a world where animal sanctuaries are no longer needed. As a true sanctuary, TWS does not buy, breed, sell or exhibit animals. PEIVDF returned for our 6th mission to The Wildcat Sanctuary (TWCS) in Sandstone, MN 0n October 21, 2017 for a very mini, one-day mission. Two domestic bengal cats and one bobcat were treated by Dr. Barron Hall. 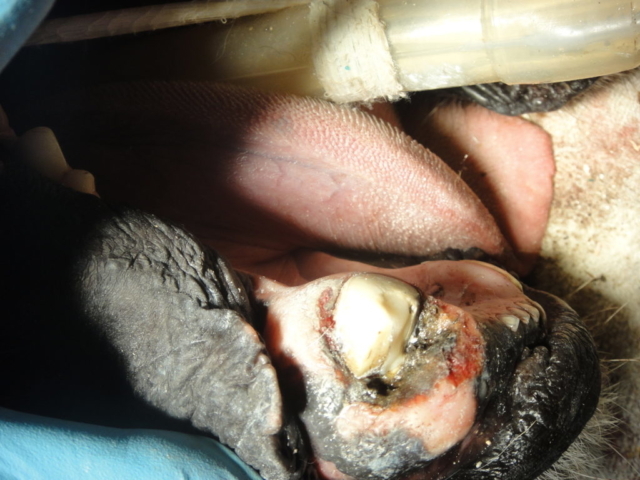 Unfortunately, prior to their rescue by TWCS, they had suffered neglect with regard to their oral care, and so only extractions – a total of (40) between the three patients – were performed. PEIVDF returned for our 5th mission to The Wildcat Sanctuary (TWCS) in Sandstone, MN in May 2016. 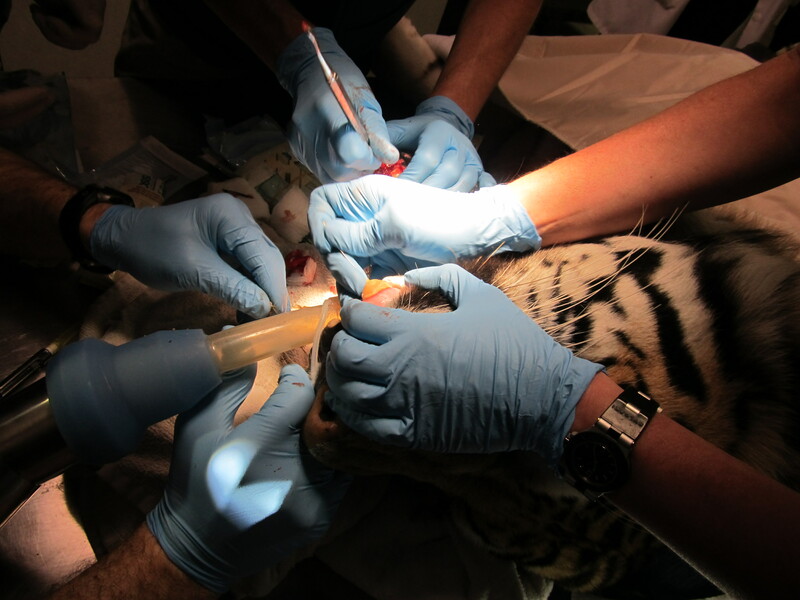 Eight doctors and technicians travelled to Sandstone to treat (6) residents: (2) tigers, (2) cougars, a lion, and a serval. Treatment consisted of (8) root canal therapies, (7) extractions, and one oral surgery. PEIVDF returned for our 4th mission to The Wildcat Sanctuary (TWCS) in Sandstone, MN in October 2014. We brought a comparatively small team of 6 to TWCS to work on (6) sanctuary residents: (2) bobcats, a caracal, a lynx, a serval, and a tiger. The patients received (5) root canal therapies, (11) extractions, and (6) other oral surgeries. PEIVDF returned to The Wildcat Sanctuary (TWCS) in Sandstone, MN in May 2013 for our 3rd mission to this wonderful sanctuary, to work on (4) four sanctuary residents. TWCS’ vet Dr. Noemi Plantz of Cedar Pet Clinic Lake Elmo was in attendance again, as well as PEIVDF mission workers, volunteers, and students. PEIVDF had three new students – one DVM and two veterinary technicians. 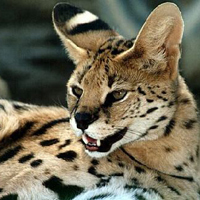 Mesa, a beautiful serval, received root canal therapy on one tooth, as did Kita, a tiger. 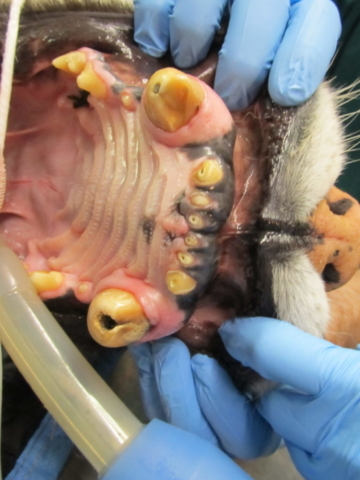 Ty, a chaussie, need root canal therapy on all four canine teeth. 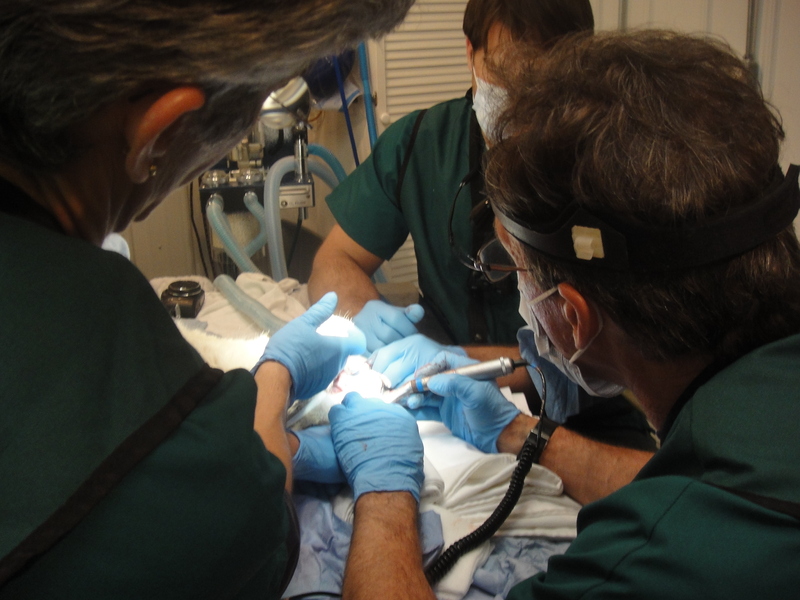 Noah, a cougar, received root canal therapy on one canine, and required extraction of another tooth. PEIVDF returned to The Wildcat Sanctuary (TWCS) in Sandstone, MN on Labor Day weekend – September 3-5, 2011 to work on (4) four sanctuary residents. The team included TWCS’ vet Dr. Noemi Plantz of Cedar Pet Clinic Lake Elmo, as well as PEIVDF mission workers, volunteers, and students – including one student who traveled all the way from Israel. Diablo Guapo – a rare black jaguar – was one of the patients. He truly is a handsome devil, isn’t he? In additional to Diablo Guapo, (2) two cougars, a Eurasian Lynx, and a Bengal domestic cat were treated. PEIVDF visited The Wildcat Sanctuary (WCS) in Sandstone, MN May 14-15, 2011 to work on (2) two sanctuary residents. Titan – a 15 year-old male Bengal tiger – required 4 root canal therapies for each of his canine teeth. 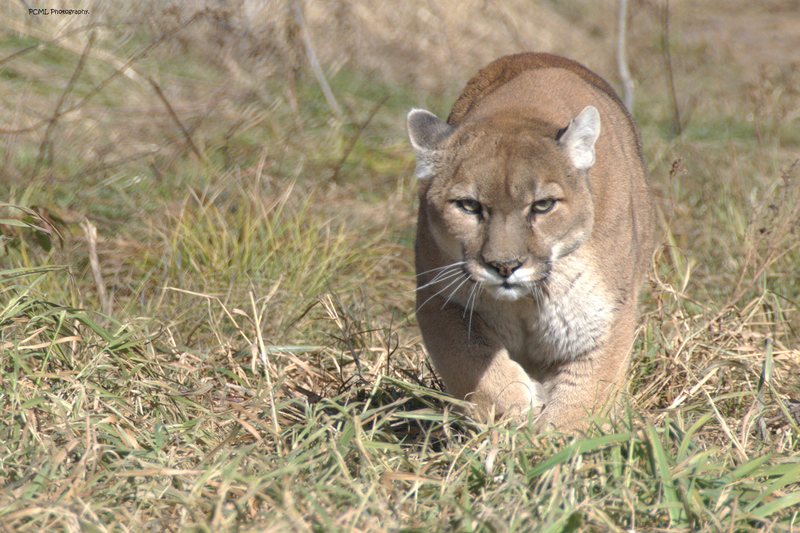 Cody -a male cougar – needed several extractions. Doctors from NM, WI, IL, CT, and VA attended the one-day mission. WCS Director Tammy Theis was so impressed with PEIVDF’s work, and so grateful for the life-improving benefits to their two cats, that they are eager to schedule a return visit. CBS Minnesota (WCCO TV) sent a team to cover the day’s work. Click HERE to view the video on their site. To read more about The Wildcat Sanctuary, click HERE to be taken to their website.